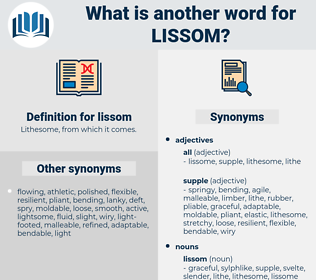 What is another word for lissom? Lithesome, from which it comes. Sprawled figures were everywhere, and on a sort of couch against the opposite wall, a cigarette between her fingers, a glass of absinthe at her elbow, her laughter and badinage ringing out as loudly as any, lay the lissom figure of Margot! The room was in darkness, but the light of a candle came from the inner room, and the next moment the door opened wide and a woman stood there, a beautiful woman, dark in hair and eyes, with figure as lissom as a young animal, poised just now half expectantly, half in fear. 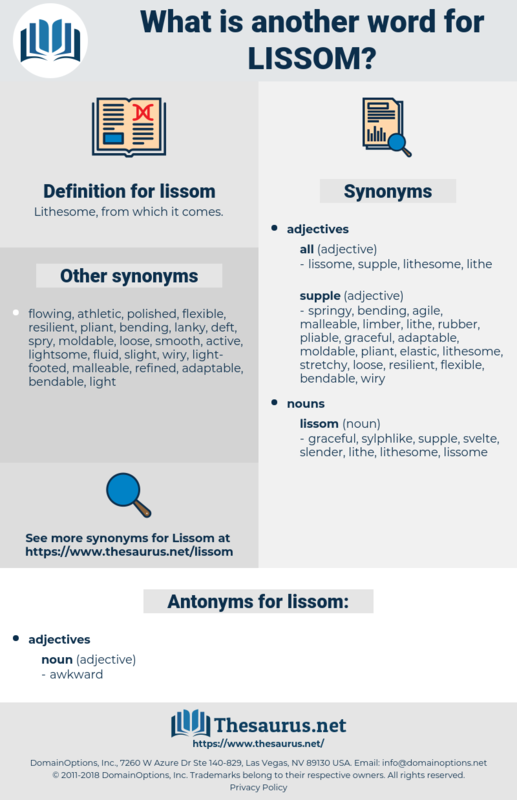 lycian, Lazy Susan, laconia, logan, lay eyes on, liaison, lycaena, lagoon, lasagna, loxoma, leucine, log-in, laconian, leccinum, logion, lagune, lasagne, lyceum, liken, lexeme, lysogeny, lycaeon, logician, louisianian, ligan, loose cannon, leukemia, logania, lichen, laocoon, lcm, lock in, log on, locoism, ligne, lesion, locum, logjam, loose woman, lysozyme, lignum, leukaemia, lacuna, log in, laguna, logicism, look on, lissome, luscinia, luzon, leucoma, lycium, logomania, lessen, liquaemin, like sin, leucaemia, Lushun, lesson, lysin, lagan, lausanne, lucania, loosen, lignin, lucknow, lysosome, lakshmi, louisianan, liegeman, leishmania, leucaena, lockman, lysine, leukoma, legume, legion, legin, louisiana, lexicon, lysinemia.